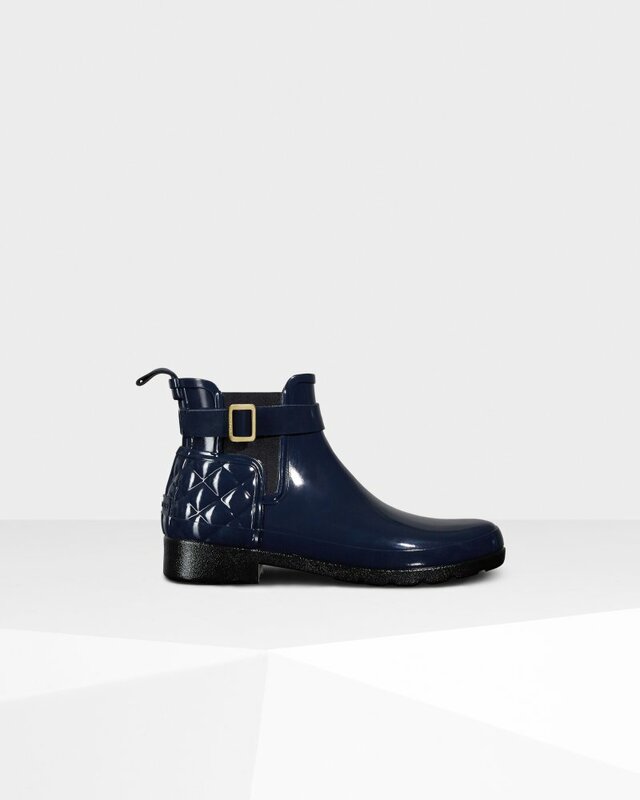 Women's Refined Slim Fit Quilted Gloss Chelsea Boots is rated 4.1 out of 5 by 34. Une version plus proche du corps de l'emblématique botte Chelsea Original, dont les éléments principaux ont été réimaginés pour créer une silhouette plus cintrée. Ce modèle se caractérise par un design matelassé et une finition particulièrement brillante. Rated 2 out of 5 by Canukchick from Struggle to get on and off These boots are ridiculously cute and fairly comfortable. They are insanely difficult to get on and off though. Sadly they’ll be going back. They should have added a zipper. Rated 5 out of 5 by Admirer from Nice boots These boots are beautiful. Professional and casual. I can't wear them due to physical purposes. Rated 4 out of 5 by AppleGirl from So gorgeous! Ok, I’ll admit they’re a little hard to get into, but worth the struggle! I love these! Rated 4 out of 5 by Laila from Versatile Bought these in oxblood on sale, a little tight (so can be difficult to put on/take off, you may want to size up for wider feet) but an awesome, versatile boot for late fall or early winter. They can go through rain or snow and are lightweight which is a huge plus. I've gotten quite a few compliments on them as well! Rated 2 out of 5 by Sammynic from So hard to get on! Bought these boots online and even after reading the reviews of how hard they are to get on, I decided to try them anyway and went a size up. They are beautiful boots (I bought the Oxblood) but they are very difficult to get on! I had to sit down and really tug on the tab on the back to get my foot in (my foot is average size and width). Once my foot was in I could see how others would think they are comfortable, however for me it's too much bother to get them on. Sadly I will be returning these. Rated 5 out of 5 by Katrina from So comfy! Love these boots. Super comfy, cute look, true to size. Rated 5 out of 5 by Nicolekat from Crazy Comfortable I love these boots. Super comfortable for long walks and even the occasional hike in the mud with the dog. Love that I can dress them up but that they are still super functional as well. Rated 5 out of 5 by Anonymous from Look good and fit well, perfect boot for the city on a rainy day or camping. Very versatile. Prompt delivery.